Publication History: This article was prepared especially for "Crain's Petrophysical Handbook" by E. R. (Ross) Crain, P.Eng. in 2013. This webpage version is the copyrighted intellectual property of the author. The objective of this webpage is to assist people who have little experience in the oil and gas industry, or who may be looking at a career path or a university specialty that could lead to an interesting and rewarding life. Most of the material here is covered in other Chapters of this website but a few of the basic concepts have been gathered here to give an overview of the subject of petrophysics. All of my 50+ year career has been involved with the science of Petrophysics, literally the physics of rocks, in some way or another. Petrophysics is a branch of Geoscience and intimately linked to geology, geophysics, and petroleum / mining engineering. There is no degree granted in pure petrophysics, so people in this field are often graduates of a closely related specialty and are self-taught from there. Petrophysics is mainly used in petroleum exploitation, but also in defining mining and ground water resources. To understand petrophysics, you need to understand rocks and the fluids they contain, how the earth's surface and subsurface change shape, and how pressure, temperature, and chemical reactions change rocks and fluids over eons of time. That's a tall order. Rocks are formed in several ways, but usually end up as moderately flat layers, at least initially (mountain building comes later). As successive layers are laid on top of each other, the Earth builds a sequence of rocks with varying physical properties. Some layers will have open spaces, called pores or porosity, that contain fluids (water, oil, or gas). A rock on Earth with porosity cannot be "empty" -- they must contain something, even if it is only air. 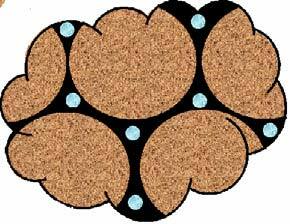 Think of a porous rock as similar to a huge sponge full of holes that can soak up fluids. Although we often talk about "oil pools", these are not tanks of oil underground -- they are porous rocks. The porosity, or quantity of open space relative to the total rock volume, can range from near zero to as much as 40%. Obviously, higher values of this physical property of a rock are good news. Some rocks have very little porosity and do not hold much in the way of fluids. These are often called "tight" rocks. Both tight and porous rocks can contain animal and plant residue that are ultimately transformed into hydrocarbons such as coal, oil, or natural gas that we can extract and use to power vehicles and heat our homes. 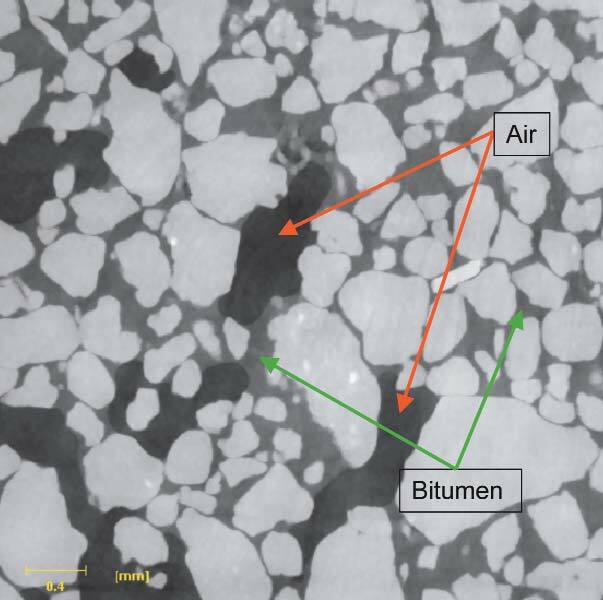 As the plant and animal residues mature into oil or gas, they may migrate through porosity or natural fractures in the rock until trapped by a non-porous rock structure. Sometimes a rock only sources itself or an adjacent porous rock, so little migration occurs. Rocks that are capable of holding hydrocarbons in economic quantities are called reservoir rocks. Rocks in which the plant and animal residue has not been fully converted to useful hydrocarbons are called source rocks. Some rocks are both source and reservoir: others are barren of hydrocarbons, and some others may act as the trapping mechanism that keeps hydrocarbons from migrating to the surface and escaping. A trap is what keeps oil and gas in the rocks until we drill wells to extract the hydrocarbons. Coal, being a solid, doesn't need a trap to be kept in place. 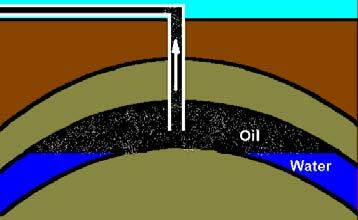 Reservoirs that contain oil or gas also contain water. The quantity of water relative to the porosity is called the water saturation. 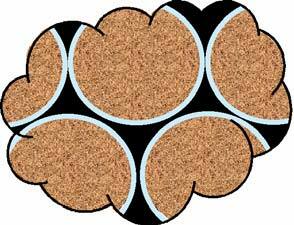 In the illustrations, the brown colour is solid rock grains and the space around the grains is the porosity. The black colour is the hydrocarbon and the white is the water, which forms a thin film coating the surfaces of each rock grain. This is a water-wet reservoir (left). In an oil-wet reservoir, the black and white colours are reversed (right). Finding and evaluating the economics of such reservoirs is the job of teams of geoscientists and engineers in petroleum and mining companies. A petrophysicist, or someone playing this role, will be part of that team. Once a useful accumulation has been found, drilling, completion, and production engineers take over to put wells on stream. 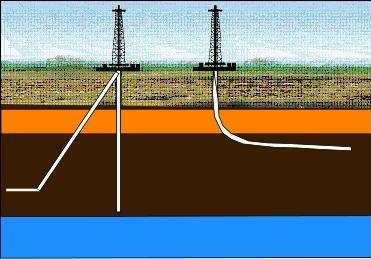 Oil production may initially flow to surface due to the pressure in the reservoir. Some oil pools do not have enough pressure to do this and need to be pumped. Depending on the reservoir drive mechanism, some wells that start flowing will later need to be pumped. Water may be produced with the oil. It is separated and disposed of by re-injection into a nearby unproductive reservoir layer. You can't just dump the water in the nearest swamp. An aquifer drive mechanism usually maintains the reservoir pressure for some time but may drop off gradually. Recovery factors vary from 30 to 80% of the oil in place. The oil water contact rises as production depletes the oil. A gas cap drive pushes oil out as the gas expands. Recovery factor is similar to aquifer drive. There may or may not be some aquifer support. the gas oil contact drops as the oil is depleted. Gas expansion reservoirs do not have aquifer or gas cap support. 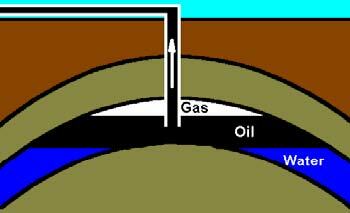 Gas dissolved in the oil expels oil into the well bore because the pressure at the well bore is below the reservoir pressure. Recovery factor is awful - usually less than 10%, but this can be improved to maybe 20% by injecting water nearby to increase or maintain the reservoir pressure. Water floods, carbon dioxide injection, and re-injection of produced gas or water can be used in nearly any reservoir to improve recovery efficiency. Gas wells do not need pumps, but if they also produce water, a special process called artificial lift is used to get the water out. That water is also disposed of legally. The economics of a reservoir varies with improving technology. Bypassed reservoirs, discovered and ignored years ago, are now economic due to technical improvements in drilling practices and reservoir stimulation techniques. Horizontal wells and deep water drilling are now common. 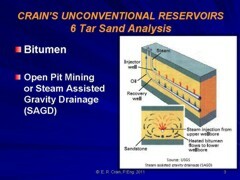 The use of heat or steam to assist production of heavy oil or bitumen, and multi-stage hydraulic fracturing to stimulate production in tighter reservoirs are relatively new techniques and relatively economic today. Obviously the specific price of oil or gas after delivery to the customer plays an important role in how much effort can be expended to recover oil and gas from underground. There is controversy, of course, about new technology. Just as the Luddites resisted the weaving machines in the early 1800's, modern Luddites insist that the old ways of oil and gas extraction are best, while at the same time complaining loudly about the price of gasoline at the pumps or the cost of electricity for their air conditioners. You can't have low-cost and low-tech at the same time. "Last week, I couldn't spell Petrophysicist. Now I are one." That describes me in 1962 as I moved from Montreal to Red Deer, Alberta to run well logs for a company called Schlumberger. The word petrophysics had been coined 20 years earlier by a geologist named Gus Archie and it wasn't used much back in the day. Lately it has attained a certain cachet, denoting a professional level career path. What is a "well log" you ask. It is a record of measurements of physical properties of rocks taken in a well bore, usually drilled for oil or gas, but possibly for ground water or minerals. Think of a ship's log. The first record of such a log dates back to 1846 when Lord Kelvin measured temperature versus depth in water wells in England, from which he deduced that the Earth was 7000 years old. The fact that he was wrong is not important. Log analysis is an imperfect science. The first logs for oil field investigation were run by the Schlumberger brothers, Marcel and Conrad, in 1928 in Pechebron, France. Soon, the service migrated to North and South America, Russia, and other locations in Asia. At that time, the only measurement that could be made was of the electrical resistivity of the rocks. High resistivity meant porous rock with oil or gas, or porous rock with fresh water, or tight rock with very low porosity. Low resistivity meant porous rock with salty water or shale. Take your pick. Local knowledge helped. One virtue of the well log was that the top and bottom of each rock layer could be defined quite accurately. When the log and depths were compared to the rock sample chips created by the drilling process, a reasonable geological interpretation might be possible, but was far from infallible. By 1932, the spontaneous potential (SP) measurement was added. The analysis rules expanded: low SP meant shale, or tight rock, or fresh water. High values meant salt water with or without oil or gas in a porous rock. The resistivity could then be used to decide on water versus hydrocarbons. Perfect. Except there were lots of shades of grey and the SP was not always capable of defining anything. Logs from 1932 in Oil City-Titusville area, Pennsylvania, the location of Edwin Drake's "First Oil Well" (in the USA - 6 other countries had oil wells predating this one). His well was only 69 feet deep, so it penetrated just to the top of these logs, which found deeper and more prolific reservoirs. Each pair of curves represents the measured data versus depth for one well. The SP is the left hand curve of each pair; deflections to the left (shaded) show porous rock. The resistivity is the curve on the right of each pair. Deflections to the right (shaded) show high resistivity, and when combined with a good SP deflection, indicate oil zones. Some good quality rocks in this example do not have high resistivity and are most likely water bearing. The gamma ray log appeared in 1936. The rules were easy: low value equaled porous reservoir or tight rocks. High values were shale. It said nothing about fluid content. By 1942, Gus Archie had defined a couple of quantitative methods that turned analysis into a mathematical game, instead of just some simple rules of thumb. His major work established a relationship between resistivity, water saturation, and porosity. If we knew porosity from rock samples measured in the lab, and a few other parameters, we could calculate water saturation from the resistivity log values. This was really new news. He even attempted to calculate porosity from the resistivity log. This worked in high quality (high porosity) reservoirs but had problems in low quality rocks or heavy oil. Just after 1945, a method that investigated the response of rocks to neutron bombardment became available. The neutron log was the first porosity indicating well log. High values meant low porosity or high porosity with gas. Low values meant high porosity with oil or water, or shale. Add the gamma ray log, SP, and resistivity and again the world was perfect, except for all those shades of grey. Calibrating the response to porosity depended on a lot of well bore environmental parameters (hole size, mud weight, temperature) so it was not terribly accurate. 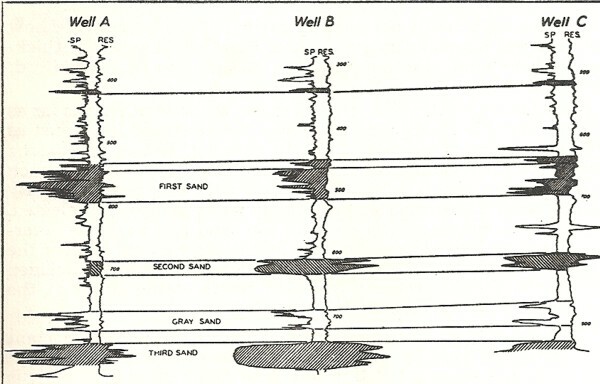 It wasn't until 1958 that the measurement of the velocity (or travel time) of sound through rocks in a well bore was achieved. It turned out that the travel time was a linear function of porosity and a few other factors. This is an example of a modern sonic log with gamma ray and caliper curves (far left), shear and compressional sonic travel time curves (middle) and sonic waveform image log (right). Depths are shown in the narrow track next to the gamma ray curve. Shortly after 1960, another porosity indicating log appeared that measured the apparent density of the rocks. Porosity was a linear function of density -- higher density meant lower porosity. Both sonic travel time and density as measured by these logs could be transformed into moderately accurate porosity values, using the gamma ray to discount shale, and the resistivity to distinguish between salty water and oil. 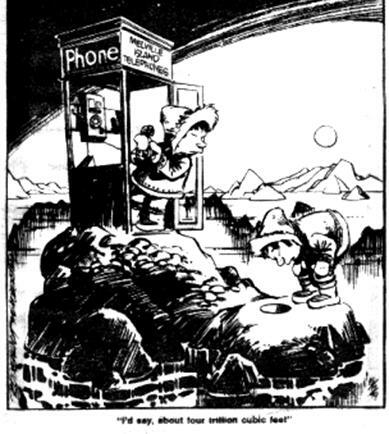 Fresh water was still a problem and gas zones could only be located if a neutron log was also run. This was the state of petrophysics when I entered the scene in 1962. The rules were obvious, the math was easy. And running the logging tools into the well bore meant lots of travel. I loved the job. There were no computers on every desk, calculators were bigger and heavier than typewriters, so the quantitative work was done with penciland paper or sliderule. Anybody know what a sliderule is? 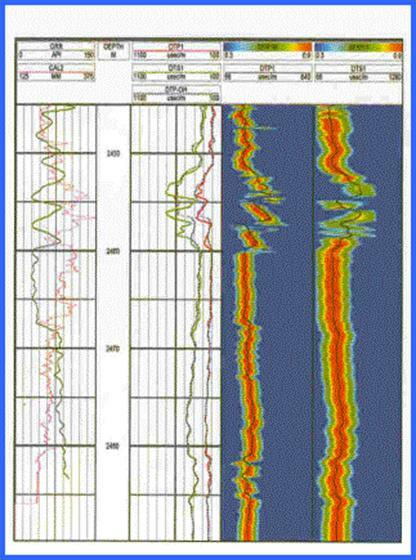 Later, with sidetracks into seismic data processing, reservoir engineering, project management, and seismic data center management, I finally noticed that petrophysics was the underlying foundation of much of geology, geophysics, and reservoir engineering. to do what our eyes could not. We now call the business "Integrated Petrophysics" because we use much more than well log data to get our answers. Lab data from core analysis, such as porosity, permeability and grain density, are critical input parameters used to calibrate our work. More exotic lab measurements have become more common as we move into unconventional reservoir types like shale gas and tight oil prospects. The table below might not mean too much to someone who is not in the oil and gas business, but it will give everyone an idea of the scope of work, wealth of data types, and the multiplicity of uses that petrophysical data can be applied to. How Much Does This Well Contribute? Is the Seismic Interpretation Realistic? What Are the Geologic Risks? Where Are The Drilling Risks? Is The Well/Pool/Project Any Good? How Do We Repair The Well?